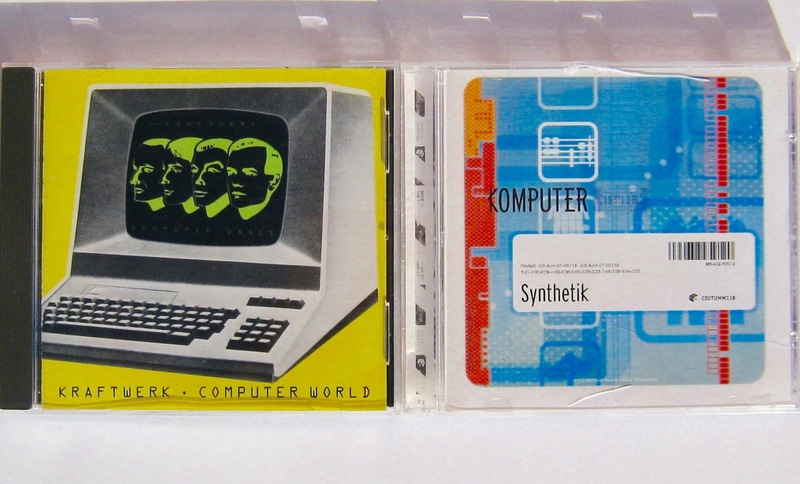 Needing to choose a CD for an album-length child-accompanied drive across the Melbourne suburbs, I pulled out Kraftwerk’s Computer World. There wasn’t much risk as the boy really likes Man-Machine. When he saw what I’d pulled out, he gave it the thumbs up and even an endorsing, ‘Good choice Daddy’, so I knew we were in for a pleasant trip. I also knew that I’d like something different for the return journey and recalled how, a year or more ago, he had enquired whether a particular CD was Kraftwerk. It wasn’t, it was Komputer, a UK electronic duo who were clearly raised on the albums of the German synthesiser/electronica pioneers. Surely a good double. And perhaps an interesting ‘Now and Then’ post. Kraftwerk released albums at fairly regular intervals from the time of their debut in 1971. After an extraordinary sequence of albums in the mid-70s – Radio-aktivität, Trans-Europe Express and Man-Machine – they took a break to recharge their capacitors and for Ralf Hütter to recover from a nasty cycling accident. Could they could come up with something new? Could they make a record without a hyphen in the title? 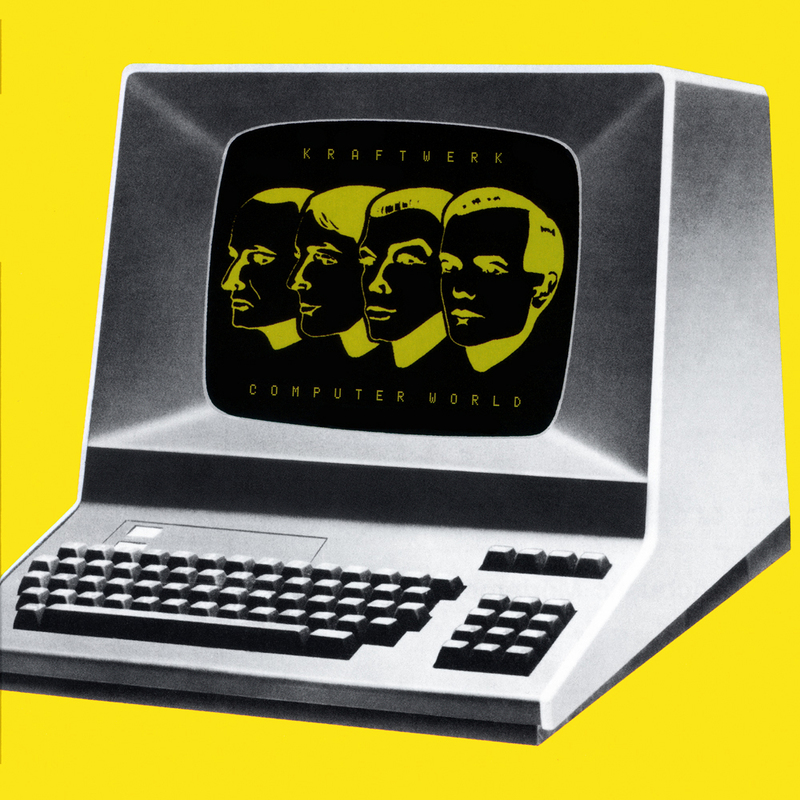 The result was the last great Kraftwerk album, Computer World; sonically brilliant, thematically prescient, and possibly their most completely realised work. The chant of greed, of success and, in this context, of dehumanisation. The pop muso of the early 80s, Kraftwerk assert, does not play but operate. The international flavour of ‘Numbers’ takes a clear oppositional position to the dominant US/UK language axis of popular culture. 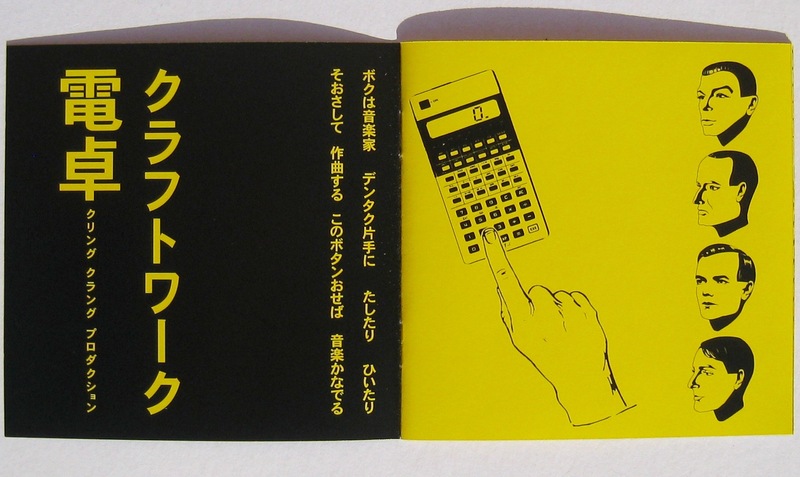 Counting initially in German, voices also chant in Italian, Japanese, Russian, French and English – but all heavily treated so as to sound distinctly android. There is no music as such, simply distorted percussion underneath and a pattering electric tick on top. So when the ‘Computer World’ melody enters, it is very striking. The chattering breakdown ending is beautiful and sinister. Not sinister, but rather sad, is the anticipation of on-line dating in ‘Computer Love’. It’s very pretty. A simple melody that invites sing-a-long. Then you’re not alone, are you? You’re singing with the man on the record. How happy I am smiling as the crystalline synth notes cascade and I dream of a rendezvous that will dissipate – or at least distract from – the numbing urban loneliness. No wonder I want to leave this time, to jump forward to a brave new world where everything sparkles with automated efficiency. Hello ‘Home computer’. That’s it, lyric-wise. But the crisply marching electrons carry us along to the upwards waterfall shower of the instrumental break that zooms around a sky metropolis like Johnny Depp crashing The Jetsons. Final track ‘It’s more fun to compute’ halves the previous song’s two lines, pruning excess verbiage so savagely that just the title remains. The repetitive sequences and smears of electronic melody somehow evoke the soul of the robot yet remain utterly human. That is the beauty and brilliance of Computer World. Not a computer in sight during its creation, just four German blokes and their keyboards spanning past, present and future. Having banged on so enthusiastically about Computer World, it’s a big ask to expect anything to match it. As Ralf and Florian might have sung, ‘it’s more fun to compete’. But we’ll avoid unseemly competition and observe that Synthetik, the 2007 album by North London duo Komputer, is a very fine follow-up indeed, and none-the-worse for copping Kraftwerk influences wholesale. Nowhere is this more evident that the opening song ‘International Space Station’. It’s like a dare. Go on! Tell us it’s sounds like a missing track from Man-Machine channelling melodic snippets from ‘Europe Endless’. Well it does, and is very enjoyable, not least be cause where you expect Germanic intonation, you get dry North London cool. The isolation from surroundings precipitated by personal devices is explored in ‘Headphones and Ringtones’, more in sorrow than anger. Sad, too, is the story of a lost cat in ‘Blackie’. The vocal delivery is very understated and has that distilled simplicity of the best Kraftwerk songs, though these stories have their own unique voice. I particularly enjoy the using of electronica to paint pictures of the natural world. ‘Like a Bird’ and ‘Rain’ do this charmingly. The latter always makes me smile, the chant of “Rainyrainyrainyrainyrainyrainy rain” over an insistent steam-driven techno beat would cheer anyone up on a day of inclement weather. “Gloopy” sounds like what it says on the box, an experimental collage of synthesised noises, while to these ears “Tokyo (we want to go)” is a close cousin of Kraftwerk’s “Music Non-stop”; again, to enjoyable effect. I love a good self-referential song, and album closer “What we do” delivers a wry, bleepy version of this with a chaotic mix of sounds and beats. Fair enough, too. 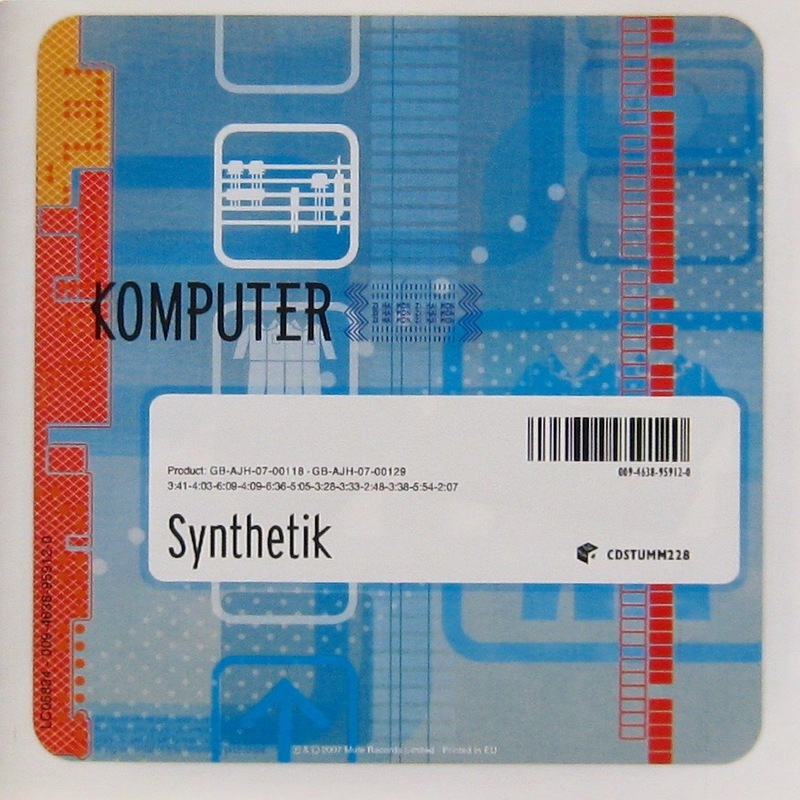 What Komputer do on Synthetik is retro-influenced electronica charged with creativity and wit. As I read this it struck me that I haven’t ever listened to Computer World! Looking at I know it’s one that’s been on my CD rack at some point, but nope … I haven’t listened to it. As for Komputer: a new one to me. Enjoyed this. Kraftwerk is great travel musik, my kids love it too. Alas, my current wife does not. I think I have an early single by Komputer somewhere, never heard the LP though.